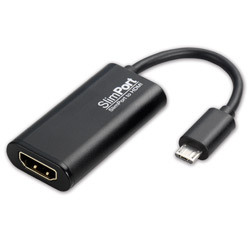 The SlimPort™ to HDMI Adapter can output video signals directly from the SlimPort™ enabled mobile device, such as mobile phone or Tablet PC, to the HDMI embedded display. 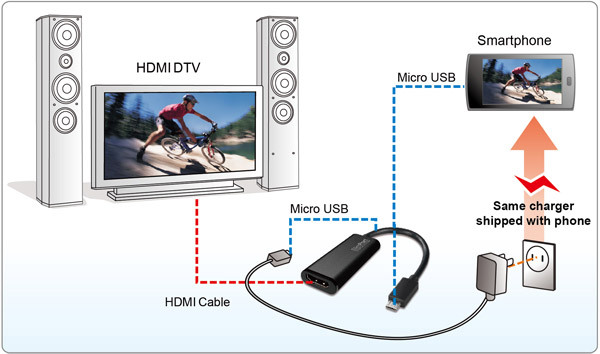 With Micro USB port charging function, the adapter allows the device to transmit signals and to charge simultaneously. Low power consumption and high resolution video output make your visual experience better than ever. * 1. For the voltage range of the power supply, please refer to the attached power adapter of your mobile device. 2. Fast charging function is only available to certain mobile devices;please refer to the manual of your mobile device.